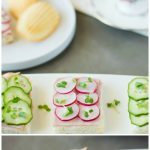 This selection of tea sandwiches is comprised of dainty finger sandwiches that are the perfect complement to an elegant afternoon tea. The tradition of afternoon tea has been enjoyed in Britain since 1840 and has become an increasingly popular event in recent years. Offered all over the world by hotels and finer restaurants, the afternoon this has become a favorite for baby showers and girlie get-togethers. Finger sandwiches, delectable desserts and, of course, tea, are the main and most important components to a complete afternoon tea. For this recipe, I’ve teamed up with Pepperidge Farm®, Best Foods®, and Hillshire Farm®. Pepperidge Farm Farmhouse™ Hearty White is my bread of choice because white bread is a must for tea sandwiches and the best possible white bread is the most crucial part of a good tea sandwich. Farmhouse Hearty White bread is made with deliberate, thoughtful care that is slow baked for a fresh out of the oven, wholesome taste. Americas #1 favorite, Best Foods® Real Mayonnaise is the spread on the sandwiches that serves as a tasty glue to keep the fillings in place and takes the sandwiches from good to great and helps amplify the flavor. The unique squeeze bottle makes for easier, cleaner distribution and quick sandwich preparation. The main part of the filling is delicious Hillshire Farm® Thin Sliced Honey Ham that is made with no artificial flavors or by-products. 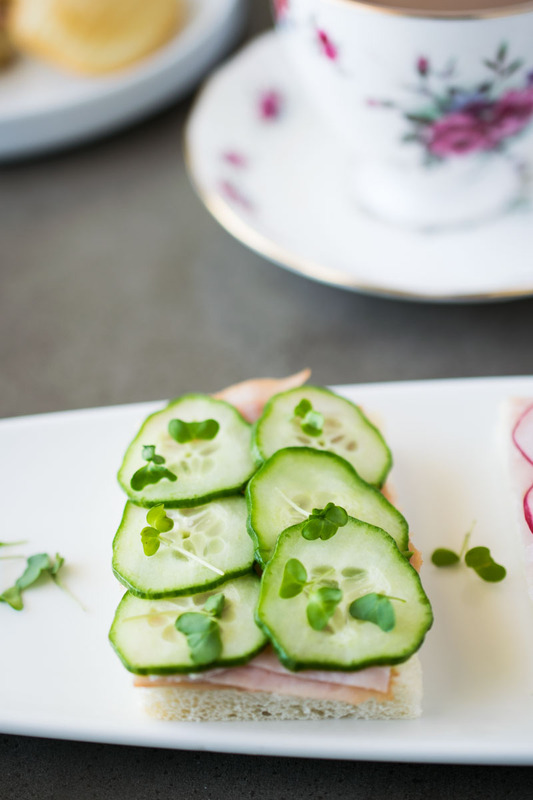 The addition of seasonal, fresh cucumber, radish and microgreens all serve to bring a little extra springtime flare. All of these products combined make for some delicious sandwiches. While I was making these sandwiches, I thought it would be nice to have a little fun by mixing and matching the fillings as well as serving some open faced, which makes for a lovely presentation. 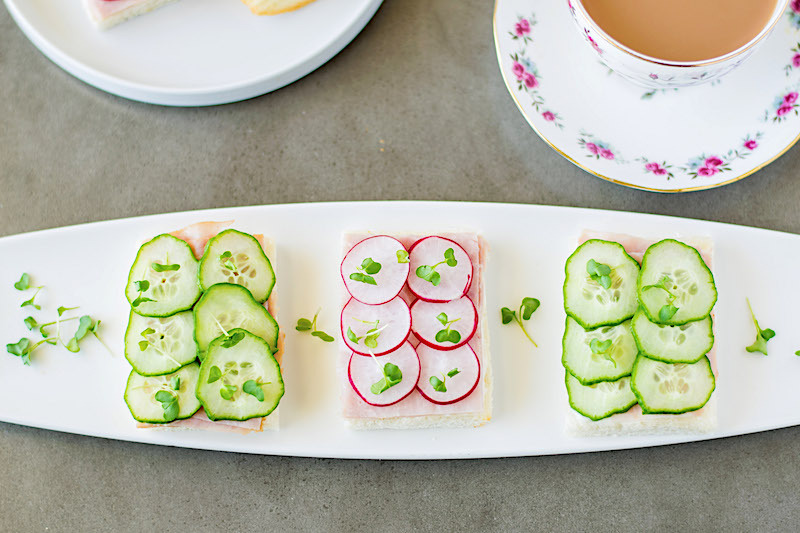 In addition to a proper presentation and keeping with tradition, the crusts are removed to make the sandwiches easier to eat and make them delicate and ladylike. Planning your own special afternoon tea is a pleasant event that you must partake in, if you’ve not already done so. If you have already taken part in this great British tradition, share with me where and when you’ve enjoyed your own afternoon tea! 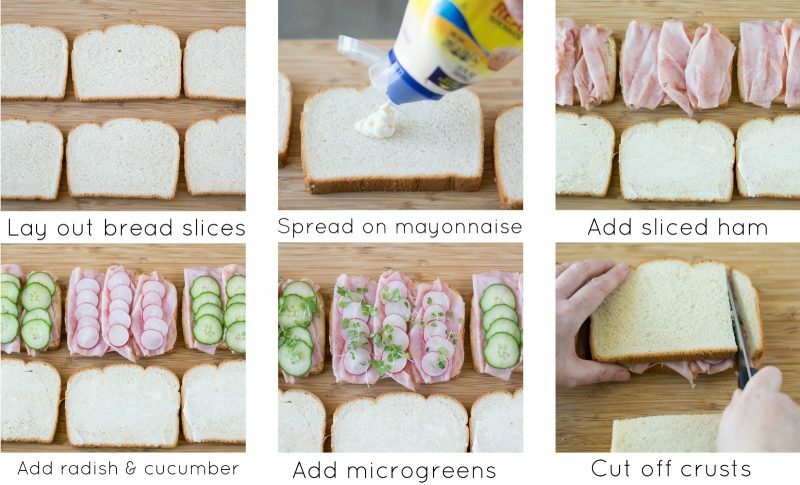 Lay out the bread slices and spread all with the mayonnaise. Add 3 slices of ham to half of the bread slices. 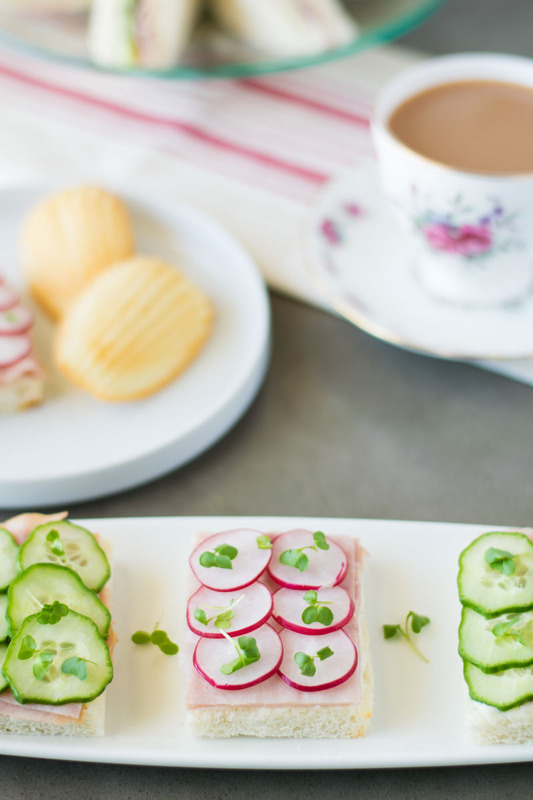 Add sliced cucumber on top of ham to half of the sandwiches and sliced radishes to the other half. Top all with microgreens. Add the tops to the sandwiches and cut off the crusts. Cut the sandwiches into triangles and/or rectangles. I wish we had afternoon tea all of the time! I’m planning one now with these treats! These look gorgeous! Great colors, perfect for Spring! Can’t wait to try them! Oh my these look yummy. I’ve often been a baby shower or bridal shower host, and sometimes I’m at a loss for what to serve. These will be perfect! And so yummy! Everyone will love how pretty they are too! Thanks! Afternoon tea is so popular for baby and bridal showers and so perfect for these events. 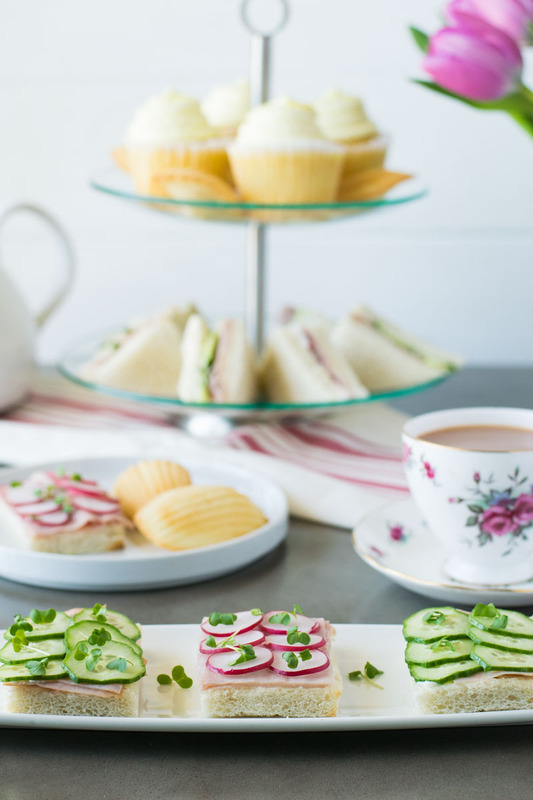 Finger sandwiches, we call them, the dainty little sandwiches served with afternoon tea. 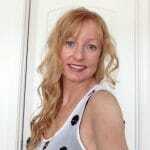 Yours look utterly delightful! I have always adored the idea of afternoon tea. I never knew that cutting off the crusts was ladylike—I learned something new! These sandwiches are gorgeous and so dainty. I love this, enjoying tea and connecting with others. So beautiful too, what a lovely recipe and idea! 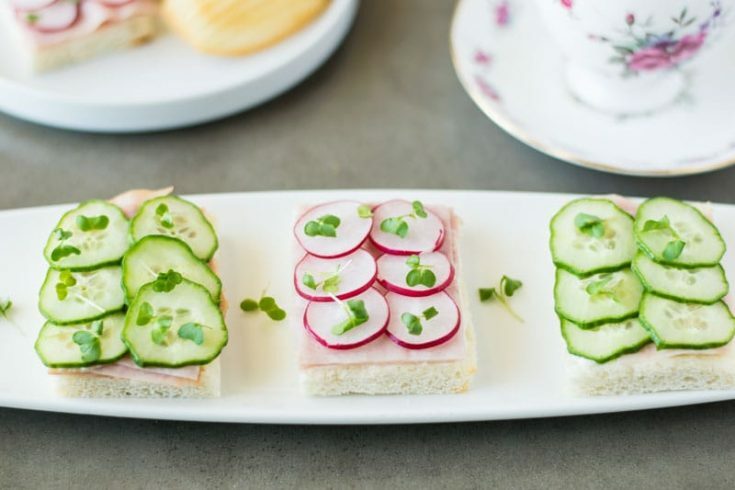 Tea sandwiches are probably the easiest and most elegant display for parties! I’m having a baby shower soon and I think our guests would love these! What a pretty colours which screams spring to me! Love dainty sandwiches like these which are not just pleasing to the eyes but also great in taste!